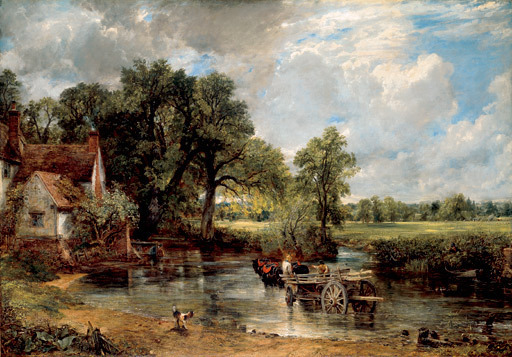 John Constable's focus was on the natural English landscape that he idolized since childhood. His paintings rebelled against the work of artists of the Neoclassical style who had simply used landscape to display historical and mythical scenes. Constable's six-foot 'Stour River scenes' are his most well-known and although he was popular in France during his lifetime, Constable never sold well in his native England. 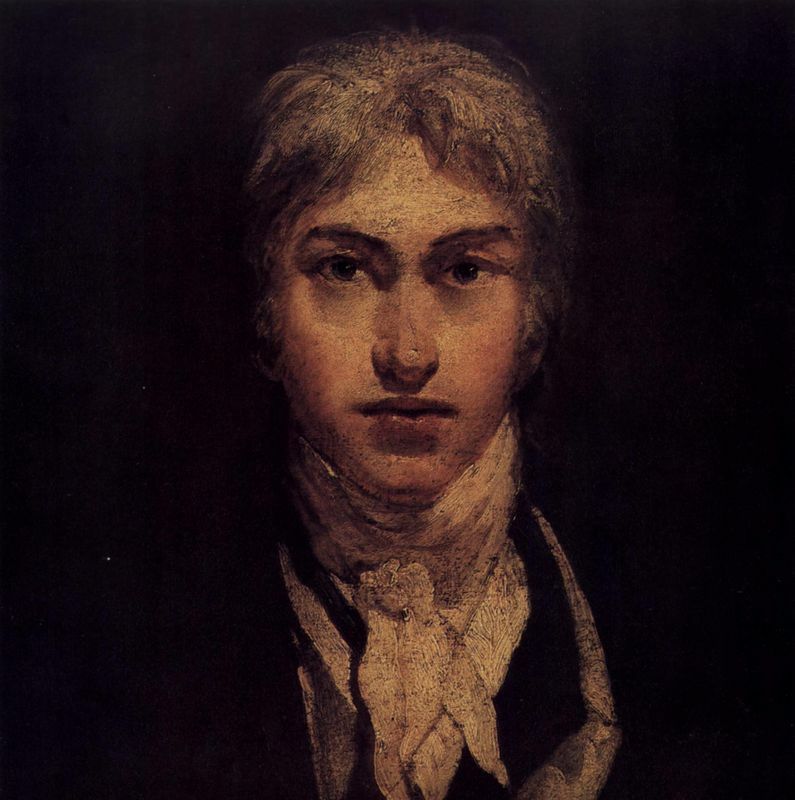 John Constable was born in 1776 to a wealthy corn merchant's family in East Bergholt, Suffolk, England. Although his father was keen for his son to take over the family business, Constable's love for art developed at a young age and his obstinate attitude would not let his father sway his decision to be an artist. 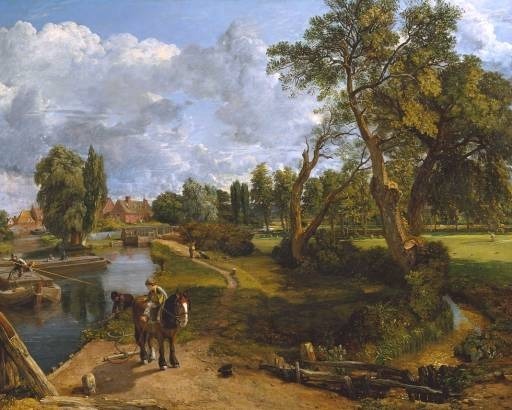 Schooled in the local village school for most of his childhood, Constable spent most of his youth in Suffolk, sketching the landscape which featured in all of his artwork as an adult. When Constable was a young man he was introduced to a collector named George Beaumont and this meeting would prove to be highly important in the development of Constable's career as an artist. 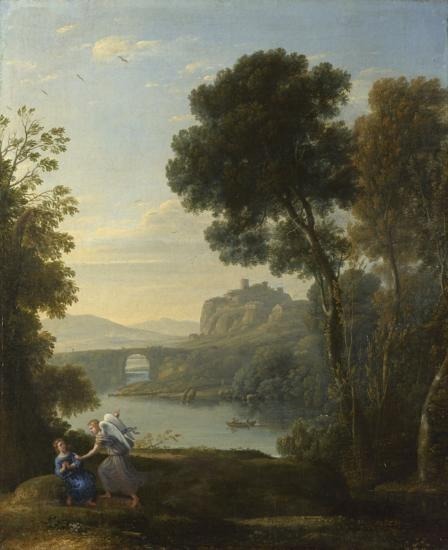 Beaumont showed Constable his prized Landscape with Hagar and the Angel by Claude Lorrain. Lorrain's influence on Constable is clear to see in his paintings and he was considered by many to be the most accomplished landscape painter pre-19th century. Another great influence for Constable was trained artist John Thomas Smith who he was introduced to while visiting relatives. 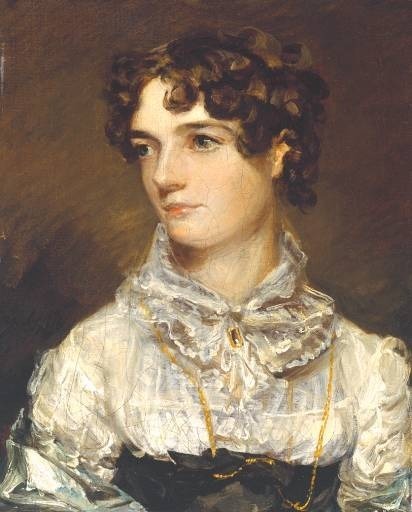 Constable married Maria Bicknell on October 1816 at St Martin-in-the-Fields. Although Constable started to display at the Royal Academy by 1806 he did not sell a painting until he was 39 and remained unpopular in his native England until after his death. In 1821 he showed The Hay Wain at the Royal Academy's exhibition and was elected an Associate of the Royal Academy that same year. After the birth of her seventh child in January 1828, Constable's wife Maria fell ill and died of tuberculosis at the age of forty-one. From that point onwards Constable chose to always dress in black and was, according to one friend, "a prey to melancholy and anxious thoughts". The artist never remarried and cared for his seven children alone for the rest of his life. 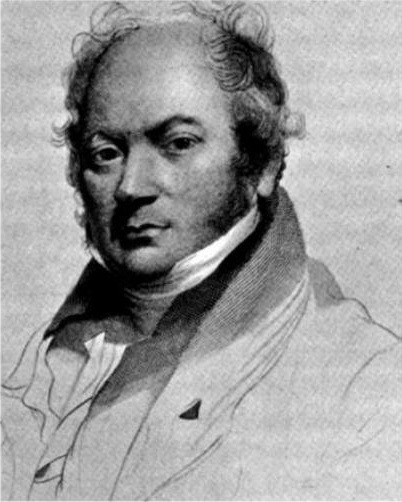 Constable died in 1835 and left behind 7 children. 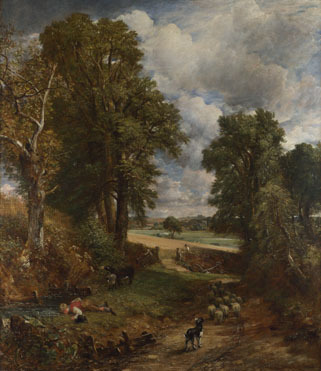 Constable's compositions were dictated by what he saw in front of him and the nature of the English countryside. He would obviously choose the direction with which he painted a scene, but he was so dedicated to the true beauty of nature that it is unlikely he would have compromised his realism for a better composition. Constable's broad and naturalistic brushstroke was frowned upon by The Royal Academy and did not earn him many patrons in England. This Impasto technique however, went on to be developed by The Impressionists of the late 19th and early 20th centuries. Until Constable became popular many landscape artist used what is known as coffee colors to create their works, especially the great Dutch masters whose works were considered to be the epitome of good landscape painting. 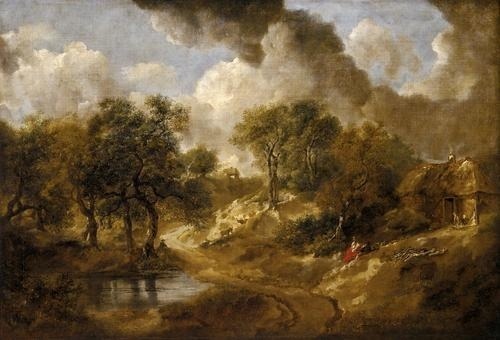 Constable had to create new techniques to give the realistic appearance of flowing water and wind blowing through trees. By layering reds with the greens of his trees, the artist was able to create this depth in a way which had never been done before. Not only this, but the reds added a vibrancy to the trees, something that was missing from classical landscapes. 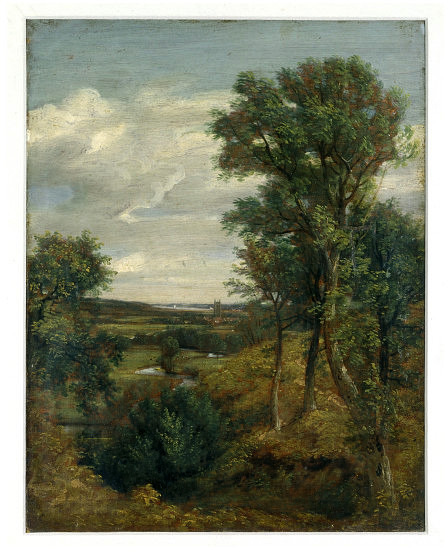 Unlike many of his contemporaries Constable painted from nature rather than thinking up a composition in his mind's eye prior to beginning a piece. Often completing primary sketches prior to starting a large canvas, Constable would draw on the inspiration nature gave him and try to capture a moment in time, testing his composition first in oil and pencil sketches. As a young boy Constable would also spend hours sketching clouds in what he referred to as his "skying" sessions. This development and skill is evident in his later works as the artist perfectly recreates cloud formations and sunlight. Constable had a wide range of influences growing up in a rich mill-owner's family. Although he would not have been as exposed to art as some of his more high-class contemporaries, the young artist had a range of famous landscape painters to help develop his art and feed his passion for nature and landscapes. One of the first great English artists, Thomas Gainsborough was noted for his portraits but was also a very successful landscape painter. Also from Suffolk, Gainsborough would have grown up in and painted the same landscapes as Constable, his continued notoriety after his death would have meant he was well-known by Constable, who was an emerging artist. The two artists shared a love of nature and Gainsborough's use of natural painting inspired Constable to say: "On looking at them [Gainsborough's paintings], we find tears in our eyes and know not what brings them." Lorrain was a master of Baroque landscape painting mainly active in Italy. A pioneer in a genre which was not deemed proper in the portrait painting art world of the time, Lorrain expanded landscape painting and helped to make it popular for centuries to come. Although his paintings normally contained some human focus, whether it be a busy port or a valley with a castle in the distance, his work was hugely influential on budding artists such as Constable. 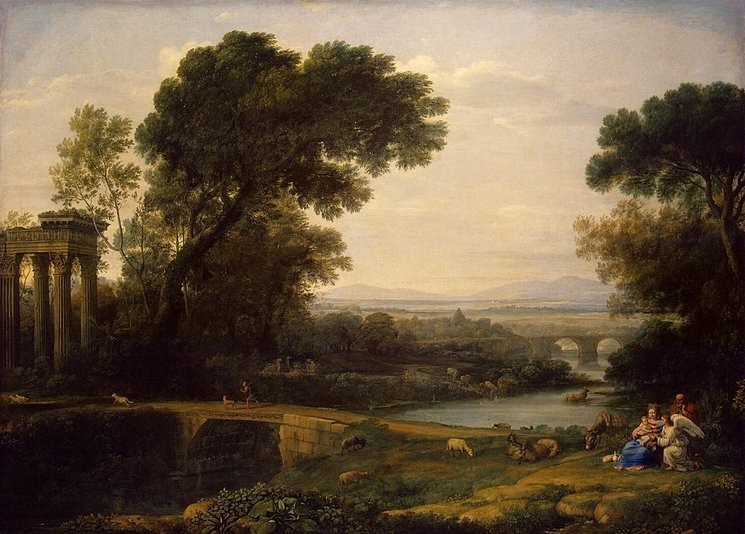 George Beaumont, a collector, showed the young Constable his prized Landscape with Hagar and the Angel and this is known to have been a great inspiration to him. 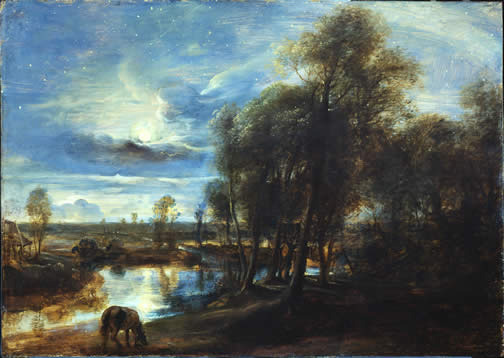 Although Rubens is famously known as a painter of religious and classical subjects, he did produce a number of landscapes in later life. As one of the earliest and most well respected painters to produce landscapes he helped to make them desirable and drew inspiration from his surroundings in his Chateau de Steen in the outskirts of Antwerp, much as Constable did from his beloved Suffolk. Due to Constable's popularity in France, especially during his lifetime, this is the place where his work had the most influence and his followers include the French Impressionists, Théodore Géricault and Ferdinand Victor Eugène Delacroix. 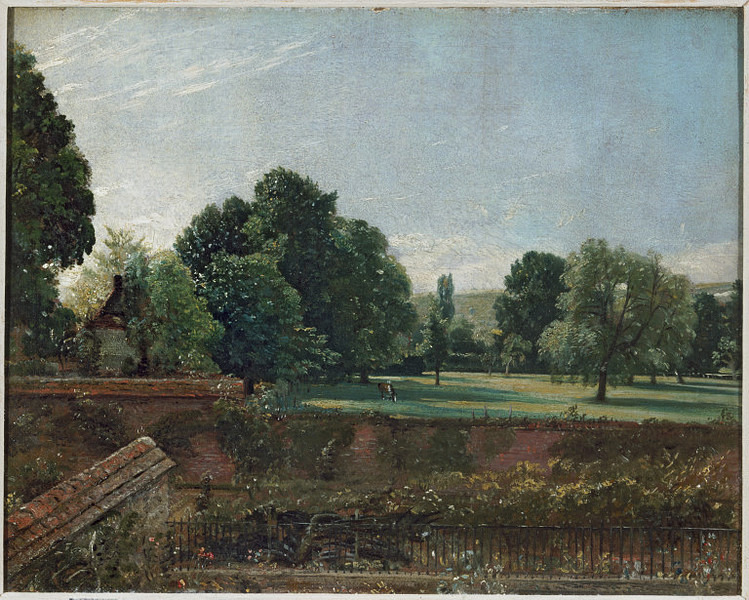 Constable's influence lead to an increase in the use of a free hand and impasto technique, whether they were solely landscape painters or not. Although Constable was not as successful an artist during his lifetime as he is thought of now, his success in France led him to rather inspirational to artists from the French Romantic movement. 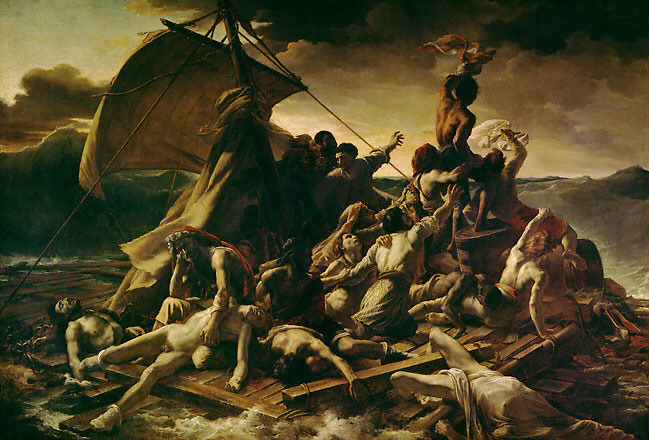 Théodore Géricault lived from 1791 until 1824 and was an influential painter in the French Romantic movement. His most famous works include The Raft of Medusa and The Charging Chasseur. 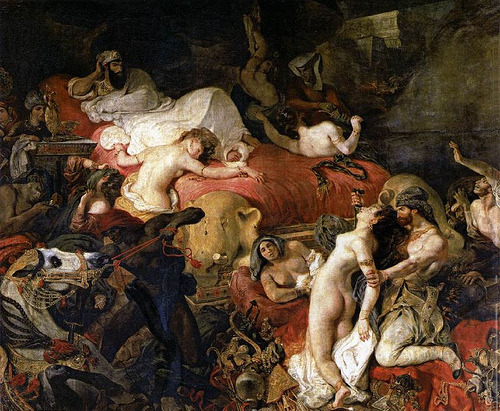 Ferdinand Victor Eugène Delacroix lived from the 26th April 1798 to the 13th August 1863 and was regarded from the outset of his career as the leader of the French Romantic School. A group of late nineteenth century painters who embodied the Romantic ideal of finding beauty in nature brought Realism to continental Europe. 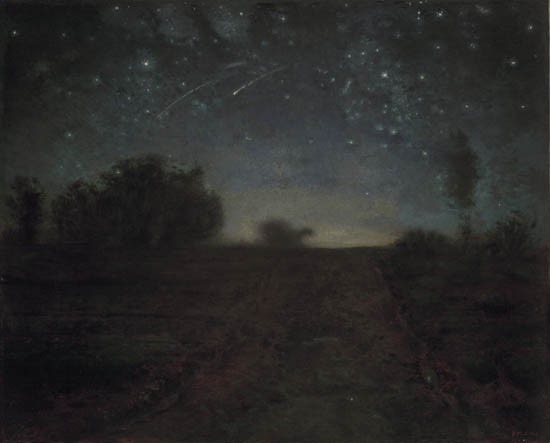 Constable's influence is clear in their works, notably in the way in which they share his love of nature and use of realistic observation, rather than using landscape as a backdrop for a historical or mythical scene as many 18th century painters chose to do. Constable's relaxed Impasto style was also developed by these painters, which was a true innovation at the time. Some of the most notable artists from this school include, Théodore Rousseau and Jean-François Millet. 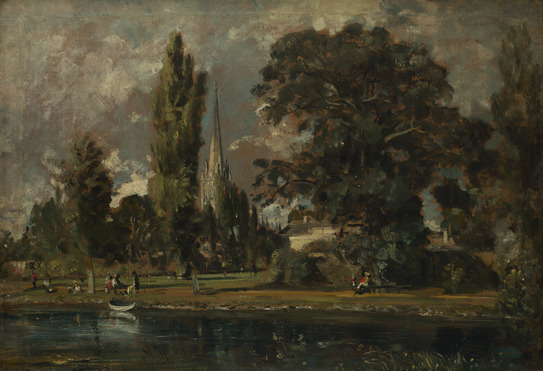 John Constable shared a mix reception during his lifetime and as with many true innovators, his art was not fully appreciated until after his death. His popularity and influence in France, however, is clear to see in later generations of painters, most notably the Impressionists. Constable is today considered, along with the likes of Turner, as one of the foremost 18th century English Artist. Recent exhibitions demonstrate his ongoing popularity and accomplishments. Constable was not highly thought of in England at the beginning of his career. The fact that he did not sell a painting until he was 39 stands testament to this, as does the fact that his first painting was sold in France. 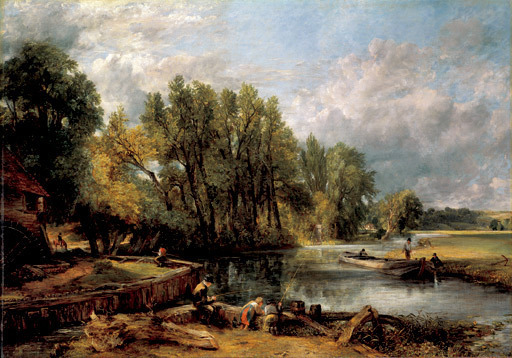 The British artistic establishment considered Constable's free brushstrokes and impasto technique to be unskilled and his obsession with nature went against the fashions of the day. It was only in Paris that Constable's work was appreciated when in 1823 he sold The Hay wain at an exhibition in the city. His reputation began to grow in Paris and he sold many works there. Although still not highly thought of in London, Constable's success in France meant that a decade later he was also selling works in his homeland and being recognized by the Royal Academy for his work. 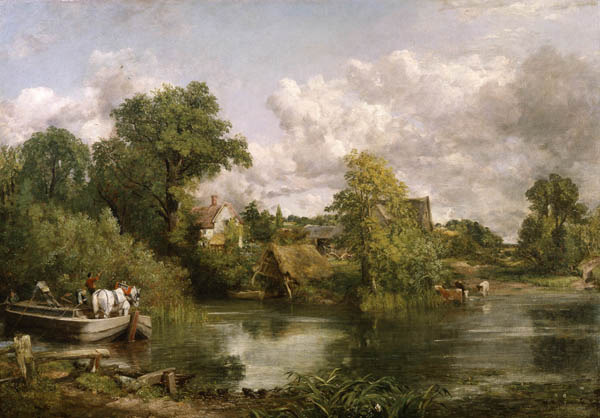 After John Constable's death in 1835 his paintings continued to gain notoriety and acclaim and when 19th century French impressionists became popular they noted Constable as an inspiration for their own work. 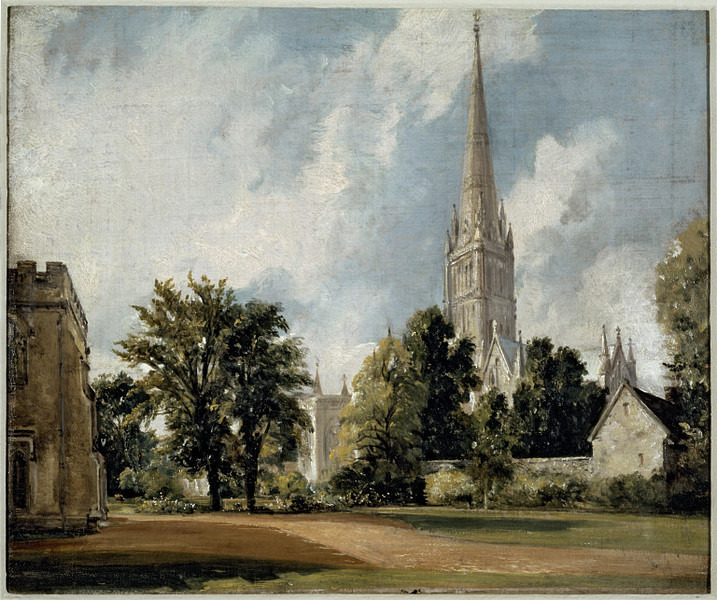 There have been several successful exhibitions of Constable's work throughout England and Europe during the last decade. Some of the most important have been at the National Gallery and the Tate Gallery both in London. Such exhibitions show the importance and interest of Constable's work so long after it was created. His innovation and originality ensures that he continues to be considered as an artist of great merit and skill.